Algebra serves as one of the basic building blocks of statistics. For example, in simple linear regression (which we will cover in ENV710), we fit a line through a set of (x,y) data points that minimizes the square of the y-distances from each point to the line. To understand the mechanics of how these regression lines are fit to the data, it is important to have a solid grasp of algebraic concepts and manipulations. A linear equation may be expressed in the form y = mx + b. The slope of the line is represented by m and the y-intercept is b. The y-intercept is where the line crosses the y-axis. Similarly, the x-intercept occurs where the line crosses the x-axis, where y=0. From this equation, we know that the slope of the line (m) is negative three. We also know that the y-intercept is five. We can figure out the x-intercept by replacing the y with zero and solving for x. If we do that, we get 0=-3x+5. Then we know that 3x=5 (by moving the -3x to the left side of the equation). So therefore the x-intercept is 5/3. The graph below illustrates this equation. 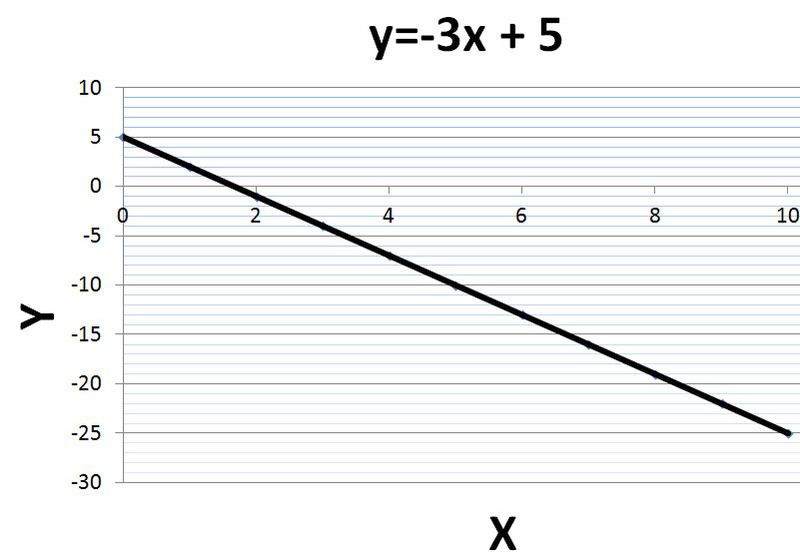 The line has a negative slope because as the value of x increases, the value of y decreases. 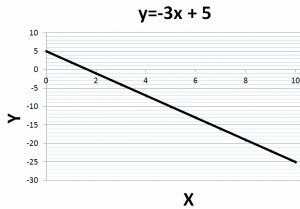 As you can see, the line crosses the y-axis at 5 and the x-axis at 5/3. Another useful tool to have in your toolbox is the ability to solve two simultaneous equations. On the statistics diagnostic exam, you should be able to solve two equations for two unknowns. You may solve by either using substitution or by elimination. Congratulations! If you have worked in order, you have now completed all of the basic math modules. Return to the Basic Math page and try the sample problems. Go to the next section on Descriptive Statistics.